I usually ride my bicycle 10 times a week. So, I was kind of interested in a Japanese animation called “Yowamushi Pedal (弱虫ペダル)” because I knew it was bike show. And finally I watched it! Japanese kanji “必勝 (Certain Victory)” is a very famous slogan in Japan. And has been around long before I was ever born. Did you notice it in the show? 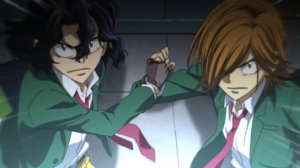 In season 1 of Yowamushi Pedal, the second-year students Junta Teshima(L) and Hajime Aoyagi(R) showed off their perfect teamwork. Then in Episode 16, we found out that they are sharing one set of gloves to motivate themselves. Technically, they are sharing a kanji word “必勝”. 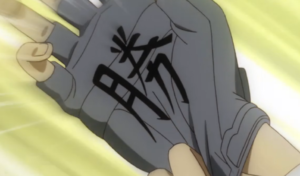 Junta wrote “必” on his right glove and Hajime did “勝” on his one. Certain Victory! They were not star character in season 1, but they became main character in season 3. 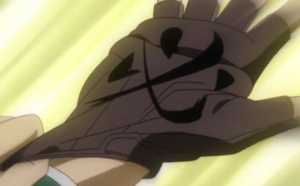 I also noticed the Certain Victory gloves in opening theme. I’m currently looking forward to season 4!